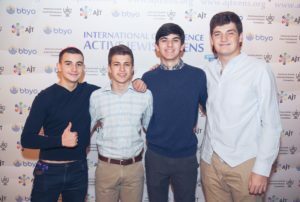 Search Results | "teen havdalah"
Editor’s note: Ben Levkovich was selected by BBYO to serve as an ambassador for the 2017 Active Jewish Teens (AJT) Conference. The conference, which is an annual gathering of Jewish teens from the former Soviet Union, was held in Ukraine last month. 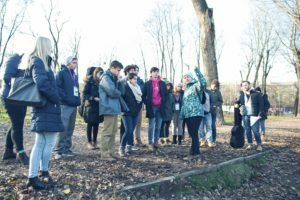 This was the first time that U.S. Jews participated in this conference, and Ben was one of two BBYO ambassadors on the trip who was a child of a Ukrainian refugee. His mother Svetlana Levkovich, of Plano, immigrated to the U.S. from Soviet Ukraine as a direct result of the policies put in place following the 1987 March on Washington allowing Soviet Jews to emigrate. BBYO’s American delegation at opening ceremonies of the AJT Conference. Ben Levkovich is third from left in the front row. Today, a resurgence of Jewish life is taking place in the land of our heritage. After centuries of destruction and hatred for Jews in Europe, we have a glimmer of hope. The past has set the foundation for our future, and today things couldn’t be more different. Growing up I heard stories from my parents of the time when they were kids. They were treated differently because they were Jewish; it’s what I’ve heard all my life. As a proud Jewish teenager in America, I felt a responsibility to travel to Ukraine when BBYO presented the opportunity to me. I learned about our people’s past firsthand. I put on my tefillin and wore my kippah proudly in a land in which my parents could not. I saw the fields and memorials of Babi Yar, the trenches of terror, the memory of the horrid moments of my ancestors — thousands of hopes and dreams crushed and broken. Bodies that held much more than a bundle of bones were trashed and burned. But we stood. The once seemingly invincible empires are gone, but we remain. The great powers of Greece or Rome no longer threaten the face of this earth, but we are still here, stronger than ever. The curtain fell but we still stand. (Left to right) Lev Feitman, Ben Levkovich, Jake Bush and Jacob Ioffe pose for pictures before Shabbat at the AJT Conference. I left Babi Yar and watched 400 Jewish teens from 10 countries gather from all corners of the former Soviet Union to celebrate their Judaism and to pronounce their love for their heritage. 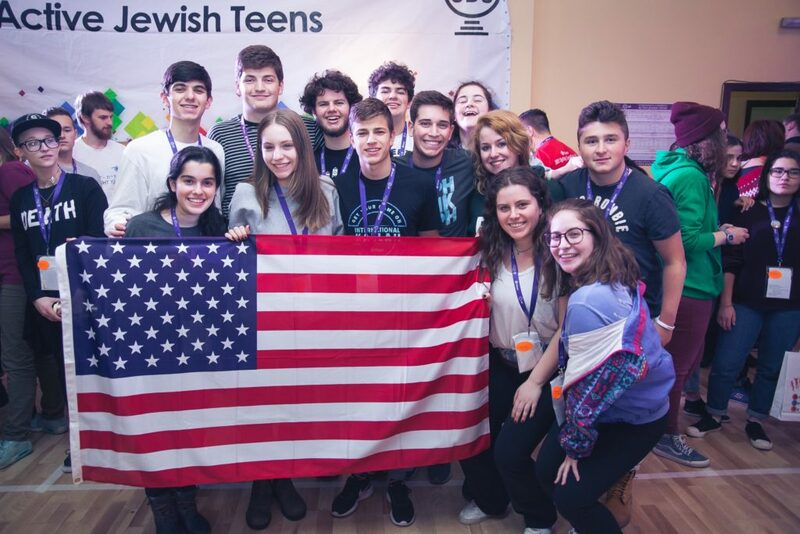 These are teens whose Jewish lives were reignited by their youth group, Active Jewish Teens. It’s the place they can truly express themselves and their outlet to Judaism. Resurgence is celebrating Shabbat with these 400 teens, whose parents weren’t allowed to do so during their childhoods. Singing Havdalah with them, arm in arm, as one circle formed by representatives of countries once associated with the oppression of Jews showed the world that we are still here and stronger than ever. These are our brothers and sisters; they are our leaders. Being connected to the global Jewish community isn’t about speaking the same language or sharing the same culture, it’s much more than that. We share the bond of Judaism. Our communal tradition has survived for millennia through trials and tribulations. We share music and prayer, and so much more. To sit together on Shabbat, singing songs that we all knew despite the oceans that separate us — this is only the start of a new bond between Jews from all over the world fostered by BBYO. I have never seen or felt the pride of Jews around me like I did this weekend. Jewish life in the former Soviet Union is flourishing like never before. The community supports one another and takes care of each other’s needs, and now, I support them too. These teens are the ones who will build a strong Jewish future — mark my words. Ben Levkovich and other American teens stand at the edge of Babi Yar looking into the trenches. Ben Levkovich, son of Svetlana and Alex Levkovich of Plano, is a Yavneh Academy junior and a member of Morton Lewis AZA. The March on Washington for Soviet Jewry was a massive rally — more than 250,000 Jews participated from across the country — held on the eve of the December 1987 Washington Summit between President Reagan and Soviet Premier Gorbachev demanding that Reagan put pressure on Gorbachev to put an end to the forced assimilation of Jews and allowing their emigration from the USSR. The Metroplex sent a large contingent to the March led by then JCRC Chair Janice Sweet. See the original TJP coverage in the Dec. 10, 1987, issue at http://bit.ly/2AYnkp8 (use the right arrow above the TJP masthead to scroll through the issue). Noah’s Ark Day is one of the long awaited Sunday Fun Days at Temple Shalom. Students of all ages enjoyed dressing up like their favorite animals. While the youngest students made a life-size ark to play in and created adorable arks filled with animal crackers, older students enjoyed coming to school in their animal footie pajamas. 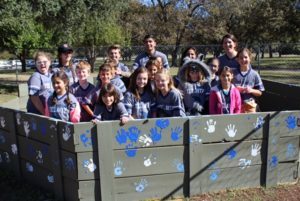 Temple Shalom fifth-graders got to spend the afternoon decorating their new gaga pit with hand prints. They were initiated into the Tel Aviv Tribe and given their brand-new Tribe T-shirts as well. The Oct. 30 Tycher Community Read, under the umbrella of the Aaron Family JCC’s Margot Rosenberg Pulitzer Dallas Jewish BookFest at the Aaron Family JCC, was a resounding success with a record 325-plus in attendance to hear Beneath A Scarlet Sky author Mark Sullivan share the history and backstories of how the book came to be. “My ‘final’ version was 820 pages and my editor said, ‘you can’t tell it all,’” said Sullivan, the final product, published in May of this year which will be made into a feature film, is 513 pages. BookFest continued this Monday, Nov. 13, with Dallas’ own Rusty Cooper and Bruce Katz emceeing a musical evening I Wrote That One Too author Steve Dorff. On Dec. 4 Lilac Girls’ author, Martha Hall Kelly will be in town. The full schedule, with programs through April 12 can be found at jccdallas.org/main/bookfest. Temple Shalom fifth-graders decorate their new gaga pit. Rabbi Chaim Kramer, founder and director of the Breslov Research Institute (BRI), visited Dallas from Nov. 10-12, to spread the wisdom of Rebbe Nachman of Breslov. 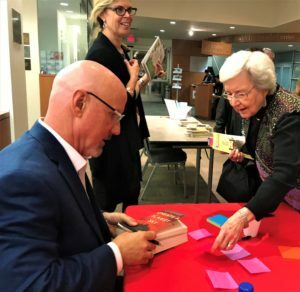 Beneath A Scarlet Sky author Mark Sullivan autographed a personal message for Tycher Community Read guest Hanna Lambert, with JCC Director of Israel Engagement and Jewish Living Rachelle Weiss Crane, still smiling about last week’s record-breaking BookFest crowd of more than 325. While the legendary Chassidic master passed away in 1810, Rebbe Nachman’s timeless teachings remain as relevant today as they did over two centuries ago. Tens of thousands of Jews from every corner of the world annually flock to his graveside in Uman, Ukraine, for Rosh HaShannah. Founded in 1979, with the objective of making Rebbe Nachman‘s lessons accessible to all, BRI has published over 100 titles on a wide array of subjects related to Kabbalah and Chassidut. These works have been translated into Hebrew, Spanish, French and Russian. 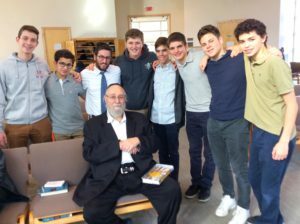 oung Israel of Dallas and addressed the high school students of Yavneh Academy, where he was received enthusiastically. Additional information on the Breslov Research Institute is available online at Breslov.org. (From left) Leib Malina, Eli Burstein, Rabbi Yoni Sonenblick, Simcha Malina, Ari Berke, Yosef Weiss, Jonah Eber and Daniel Garren enjoy a moment with Rabbi Chaim Kramer (seated) at Yavneh. On Dec. 9, the Jewish Community Relations council will hold a Community Teen Havdalah. Following Havdallah, led by musical duo “Eric and Happie” there will be an Israel education and advocacy training program to prepare teens for college, “Israel on Campus: A Reality Check.” This will be an interactive program of discussion and dialogue led by young adults (25 years old). The program will end with a Closing Circle and songs led by Eric and Happie. Partners for the evening at press time are Adat Chaverim, Beth El – Fort Worth/Camp Impact, Anshai Torah, Congregation Beth Torah, Shaare Tefila, Temple Shalom, Aaron Family Jewish Community Center, BBYO, Congregation Shearith Israel, Shir Tikvah Frisco, Tiferet Israel and the JCRC. On Jan. 28, Howie Mandel will be the featured performer for One Night, The Jewish Federation of Greater Dallas’ biggest fundraising event of the year. Co-chairs for the evening are Angela Horowitz and Doug French, Jolie and Michael Newman and Natalie and Michael Waldman. More information can be found at www.jewishdallas.org. I wrote this four days ago, after I had just returned from Reading the Names. The Beth Torah Men’s Club had this inspired idea, began it in 2003, and it’s now a sacred tradition. Anyone who wants to read names may do so. It’s a 24-hour vigil, beginning after Havdalah on the Saturday closest to Yom HaShoah, and ending at Sunday’s sundown. (Guess who reads through the wee small hours? Teenagers who have an all-nighter under the watchful supervision of youth group leaders and Learning Center personnel.) This tradition was started by Beth Torah, but was immediately opened to the greater community; now, folks of other synagogues, of churches and mosques, come; some even Skype in — sometimes from as far away as Israel. The names come from Holocaust museums that lend what they have: the Nazis’ own records of their victims. Who lived where? Died where? At what age? Germans have always been efficient at keeping details; the Holocaust was no exception. People who don’t want to read are encouraged to come, sit quietly and just listen, to hear the names read aloud so that those who have drawn their last breaths now become people who have not died that second time. So, I sat in the darkened synagogue sanctuary until it was my turn to read, listening to others, facing the line of 11 candles lit in memory of our own 6 million, plus the 5 million others who shared their horrific fates. Israel’s three most special days are in this order: Very soon after Yom HaShoah, when Holocaust survivors are celebrated and victims memorialized, comes Yom HaZikaron, paying tribute to those who have given their all as soldiers of their country, and others who have suffered terrorism. Then, just one day later, comes Yom HaAtzmaut: Independence Day. After first mourning the long-gone, then stopping all activity for an incredible silence to salute those whose bravery and suffering have made their country live, Israelis burst out in a show of life like nowhere else in the world. That final day is today. Let’s celebrate, too. And let’s mark our calendars now, to join in the Reading of the Names next year.